So let’s start with the rice. The crust (tahdig) in this case was a mixture of butter and grapeseed oil, which has a very mild taste, and helps prevent the butter from browning too much. That would make the rice bitter. Some recipes elaborate on this simple concept by making the crust with thin slices of pita bread, for instance. Or using yogurt, even potatoes. A nice culinary project to play with. I ended up using inspiration from several sources, but kept it simple, butter it was. Rinse the rice in several changes of cold water until the water runs clear, then leave to soak in a large bowl of water for 20 to 30 minutes. Drain and set aside. Bring a large pot of water to the boil and add 2 tablespoons of salt. Add the rice and cook for 5 minutes. The grains should still be pretty firm at this point. Drain, rinse briefly with cold water to prevent it from cooking any further. Reserve. Make the saffron infusion by using a pestle and mortar to grind the saffron strands with a pinch of sugar and salt, then dissolve it with the very hot water. Leave to steep for a few minutes. 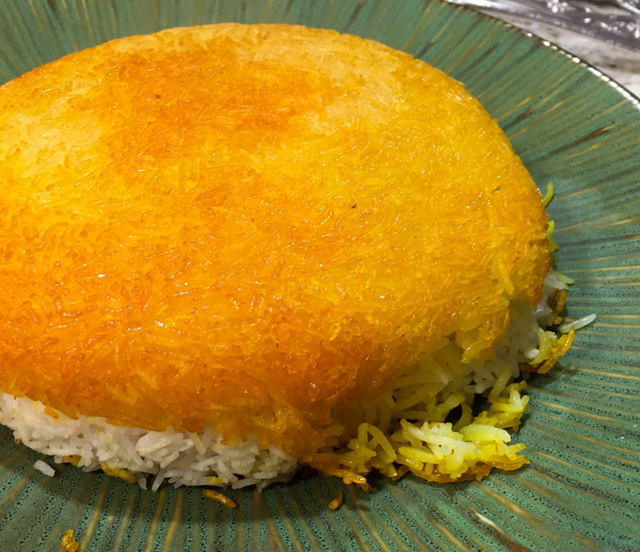 To make a plain tahdig for this amount of rice, you need an 8-inch nonstick saucepan with a snug-fitting lid. Melt 1 tablespoon of the butter with the grapeseed oil over medium heat on an 8-inch nonstick pan. Add 1 tablespoon of the saffron liquid. When the oil is hot, sprinkle a thin layer of rice over the bottom and firmly press it down, covering the bottom of the pan. Carefully lay the rest of the rice on top, allowing it to form a domed shape at the center. Using the handle of a wooden spoon, make a few holes in the rice, almost reaching the bottom of the pan. Place the remaining tablespoon of butter, cut in little pieces, in the holes you formed. Sprinkle the rest of the saffron liquid on top of the rice, then put either a tea towel or four layers of paper towels on the surface, tucking the edges in. Cook the rice on medium heat for 5 minutes, then turn the heat down, as low as your stove will go, and cook for 15 minutes longer. Take it off the heat and allow it to sit for a few minutes, while you fill your sink with a couple of inches of very cold water. Place the saucepan in the water. That will loosen the crust at the bottom, and should allow you to un-mold it nicely. Take the lid off, put a large plate on top, and without hesitation, flip the pan over to release the rice on the plate. If all goes well, you’ll be rewarded with a beautiful rice “cake”, a nice crust on top of perfectly cooked Basmati rice. Comments: I wanted to follow the recipe quite closely, so I was compelled to get a mortar and pestle for it. I know, life can be tough. But the Force was with me, because Marshalls had a few for sale – cannot beat their prices – in fact they had two kinds, and I brought one home with me. 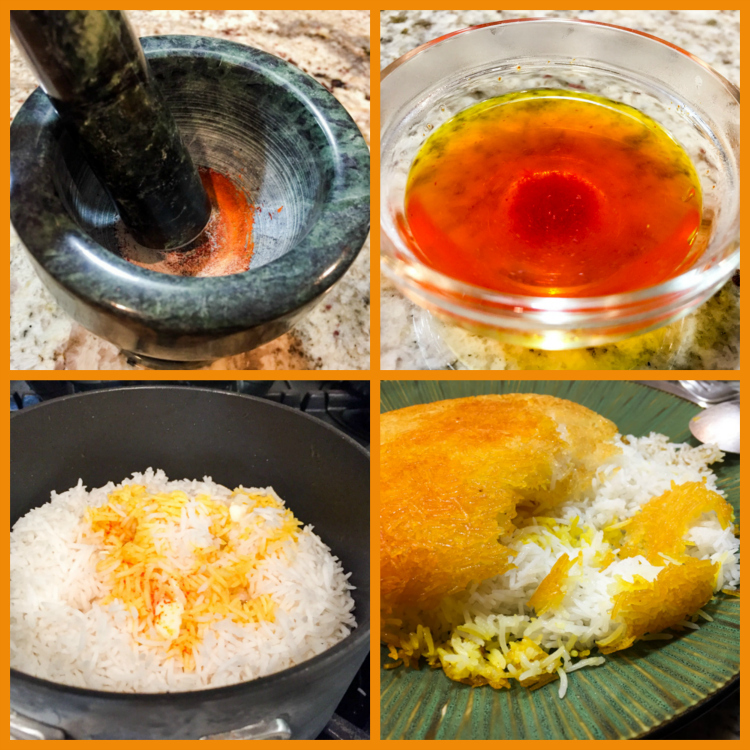 The method of choice to deal with saffron in Middle Eastern cuisine is to crush it with a little sugar and a little salt. Water then is added to solubilize it as best as possible, and that beautiful golden liquid is used in the recipe. My heart was beating fast when I un-molded the pan, but it worked like a charm! That crust is simply addictive. Even though Phil was the guest of honor for obvious reasons, I put up a mild fight for the real crusty bits, after all, I slaved away at the whole menu. Carioca Cake, remember? That should give me bids on 85% of the rice crust. But because I am of magnanimous nature, I settled for 60%. Heat 3 tablespoons of oil in a saute pan and fry the shallots over very low heat until golden brown, take your time and allow the deep flavors to develop. 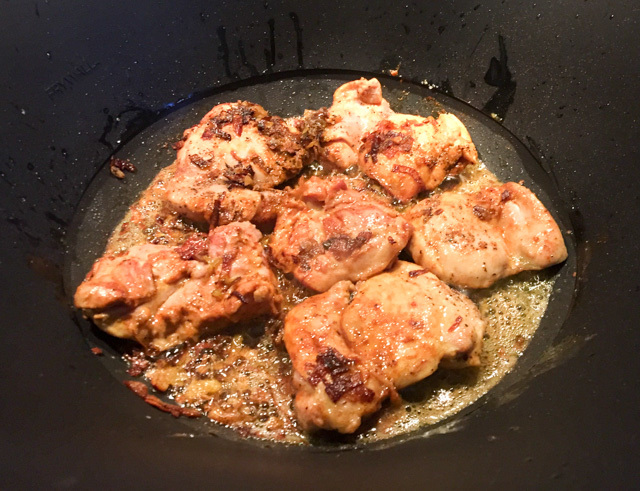 Season the chicken pieces all over with salt, add to the saute pan with the caramelized shallots, then add the cumin, coriander, cinnamon, turmeric and black pepper. Cook until the chicken is golden on all sides, then transfer to a pressure cooker. Add one cup of stock, if it almost cover the meat it will be enough, if not add another half a cup. Close the pressure cooker and once it reaches full pressure, cook for 18 minutes. In the meantime, add boiling water to the apricots and prunes in a small bowl, and let them sit to soften slightly. At the end of 18 minutes, release the pressure running the pan under the faucet with cold water. Grind the saffron with a pinch of sugar and salt in the pestle and mortar and then transfer to a cup and leave to steep in very hot water for 2 minutes. 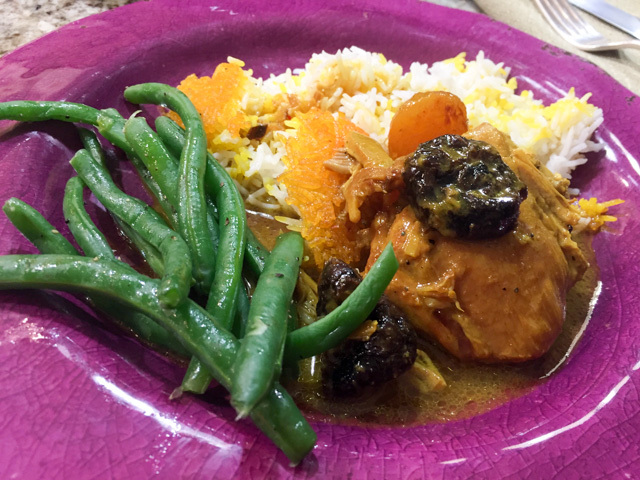 When the chicken is ready, add the softened fruit, along with the lemon juice and the saffron liquid. Simmer on low heat for 10 minutes with the lid off, until the sauce has thickened slightly. Adjust seasoning and serve over rice, or another side dish of your choice. No pressure cooker? 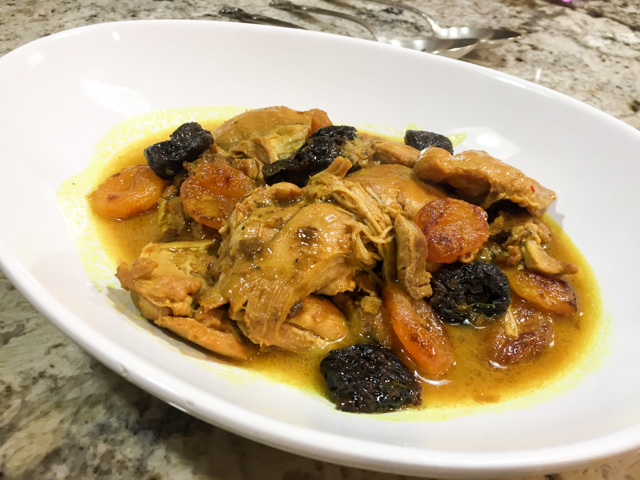 Use any heavy pan with a tight lid and cook the chicken for about 40 minutes, until very tender, then proceed with the addition of fruits and saffron liquid. 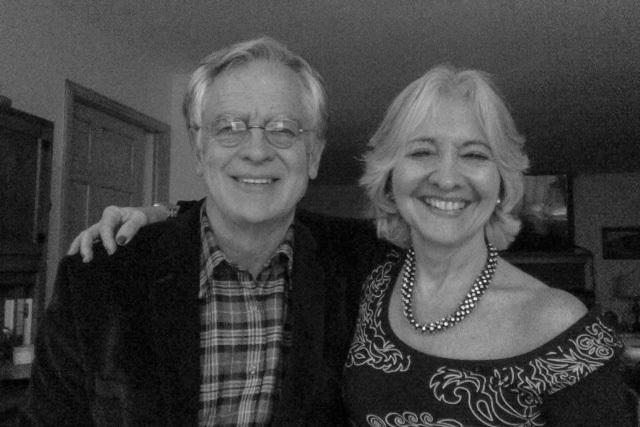 One more Birthday celebration together!